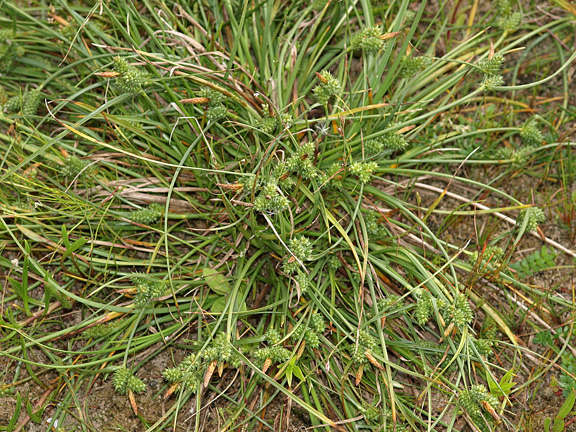 Carex extensa.John Somerville.www.british-wild-flowers.co.uk (Accessed 5/2014). Carex extensa is a perennial, stems tufted, 20-50 cm tall, very tough, wiry, gray-green, sheaths red-dotted on ventral side. Leaves alternate, stiff, rolled inward, base of sheath reddish (Flora of North America Editorial Committee 1993+), shorter than flowering stems, inflorescence bracts like leaves, only the lowest with sheath; basal leaves semi-evergreen. 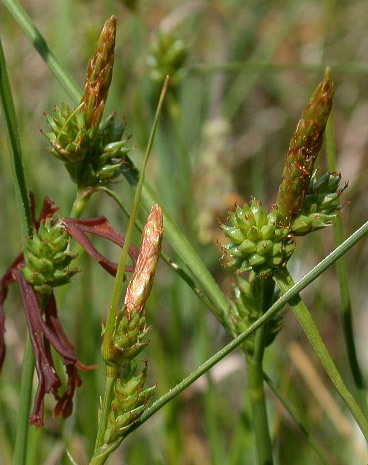 Carex extensa inflorescences. Photo © Carl Farmer. Skye, 6/2003, plant-identification.co.uk (Accessed 12/2017). Flowers dry, tiny, monoecious, male spike terminal, female spikes 2-4, thick-cylindrical, 0.5-2 cm long, the top 2-3 crowded, sessile, the lowest, when present, remote and stalked, female florets (perigynia) large, 0.3-0.4 cm long, beaked, tip 2-toothed, crowded, scales smaller than perigynia, brownish. Fruit dry, 1-seeded achenes, 3-angled. Frequency in NYC: Very infrequent but in large dense stands where present. Habitat: Upper high marsh with Juncus gerardii (displacing J. gerardii? ).